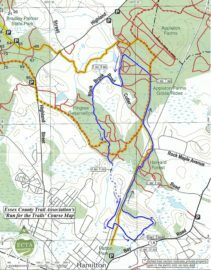 For all trail users: ECTA will be hosting our 14th annual Run for the Trails 5 and 10 mile race Saturday, September 15th. Below is a map of our course. The race starts at the Myopia Schooling Field in Hamilton, MA, and will go through Harvard Woods, Appleton Farms, and Pingree Reservation. There will be runners along this route from 9am to 12pm, so please be courteous and avoid this area during this time. We very much appreciate it!